With reduced curb weight and sport suspension Porsche released first ever Cayenne GTS back in 2008. Since then the model kept on receiving updates and upgrades, let that be under its hood or in terms of design and comfort. 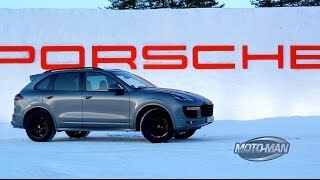 Now with unveil of Porsche Cayenne GTS 2015, let us see what company has for its buyers. Distinct features and classy color combinations makes the interior of Porsche Cayenne GTS way ahead of standard Cayenne. Driver gets its riding comfort inside through eight way adjustable, Leather and Alcantara wrapped sports seats with headrests getting GTS embossed on them. Another remarkable feature making it sporty is the all new multi function steering wheel. This isn’t all that makes Porsche Cayenne GTS 2015 distinct with its GTS badge. Next taking the jump are the optional ventilated seat with guaranteed comfort. In all we found the interior of Cayenne GTS 2015 a comfortable riding experience with GTS power and command. 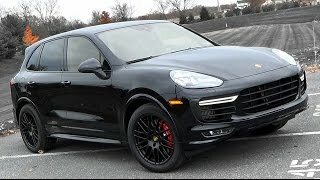 Changes in exterior of Porsche Cayenne GTS 2015 begin with the all new grille amidst bigger air vents giving front fascia an aggressive look. In the same arena headlamps too gets touch of revision beholding daytime four point LED running light and last in series are the fog lamps beneath get a new look to compliment the entire front fascia of Cayenne GTS 2015. Moving back towards the rear fascia of Cayenne GTS 2015 first to catch the attention is the body-colored roof spoiler adding touch of sports car with its looks. Side skirts, wheel arch and bumpers are also matching the color of Porsche Cayenne GTS 2015. To add more in the taste of sportive aggression 20” wheels beneath the muscular wheel arches won the accolades, leaving an unmatched identity while rolling down the lane. 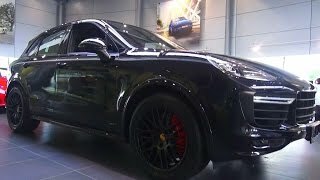 Porsche Cayenne GTS 2015 is powered by a 3.6 Liter V6 twin-turbo engine delivering 440 hp and 600 nm torque. 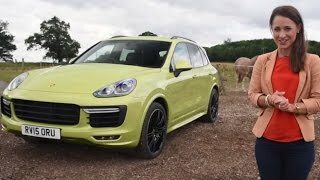 It isn’t just the power to be talked in the performance segment of Cayenne GTS 2015. The model with its standard exhaust system brings out model-specific sound while the V6 switching tradition V8 brings for buyers better mileage. Also the car comes with PASM lowering the ride height by 0.8 inches. However with its power, Cayenne GTS 2015 is capable of reaching top speed of 162 mph while it covers the 0-62 mph sprint in just 5.2 seconds.